"Wow!" Was the common exclamation among retirees who were recently introduced to Drum Corps International. 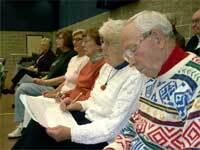 Students at Kellogg Community College's Institute for Learning in Retirement study drill sheets. Participants in the group were members of Kellogg Community College's Institute for Learning in Retirement, located in Battle Creek, Mich. A variety of short courses are offered throughout the year, that including computers, history, art appreciation, comparative religion and others. Teresa Durham, program director of the Institute for Learning in Retirement, was scouting for an instructor willing to teach a musical subject to the seniors. She found retired band director Jack Bender of Hastings, Mich. "Out of the blue, I got a call from Teresa on my cell phone," said Bender. "She asked me to name a passion of mine. I was driving over rural roads at the time and, through signal problems, I blurted out the first thing that came to mind -- marching bands and drum corps." Bender left band directing 20 years ago and just recently retired from teaching. He shared why DCI immediately came to mind when Durham called him. "I had gradually stopped following DCI closely and realized what I was missing. This summer I traveled to Indianapolis to see the DCI Midwestern Championship in late July. On hearing the first note of the evening show, I looked through my tears to see my wife tearing up as well. My son and daughter were both field conductors of their high school band and had grown up with DCI shows and videos. My daughter used her cell phone to share the moment with my son, who was unable to be with us." The first class of the three DCI-oriented classes at the Institute for Learning in Retirement centered on music selection. Retirees heard a variety of styles and were asked to sense the emotional impact the music had on them. The intensity levels of some pieces were graphed on a white board. The students came to understand that opening and closing moments of a show could be delicate or bombastic. The second class focused on drill design. Still photos presented examples of spacing, staging, basic forms and the integration of elements. Showing a few DCI corps performances made the concepts come alive. "Seeing the DCI competition on tape made the presentations on music selection and drill come to life! I will definitely check out the DCI Web site and finals broadcast," said retiree Barb Kirkwood. Jean Raley, 81, said, "It was a thrill to watch the corps of DCI. The young people performing were awesome." Ellie Wagner, 75, excitedly remarked, "As a band member 60 years ago, I am in awe of what corps members do." Bender sensed the admiration participants had for the performers. DCI's Ed Dempsey fielded Bender's call at DCI headquarters and his request for something up-to-date to show to the group. Dempsey forwarded the 2003 finals DVD made for the television broadcast. The focus on individual corps members was a hit with the students, and the byproduct of seeing DCI in action was a renewed faith in youth. Bob Wagner, 80, who spent 39 years in the sports department of the Kalamazoo Gazette, declared, "The dedication of corps members surpasses that of many who desire to become professional athletes." "Excitement, precision, commitment!" observed Judith Josephson. Bender emphasized opportunities past the end of class. "We shared announcements of upcoming concerts and traded video titles such as "Blast!," "Stomp," "Drumline," "Brassed Off," and others." Special emphasis was placed on the DCI Web site, the annual DCI broadcast special and a developing possibility of a DCI show in nearby Kalamazoo at Western Michigan University's Bronco Stadium. "This class was a surprise!" offered retiree Beverly DeBoer. "I had no idea what all was involved. I hope a DCI competition is hosted nearby." A number of participants have grandchildren in local high school bands and the class turned a special application for them. "We have two grandchildren in band and this experience really helped my awareness," said Phyllis Bokhart. Charlotte Borr, 73 (and retired nurse), said, "This class was a real eye-opener for me. I have always enjoyed marching bands, but I will appreciate them (and especially drum corps) even more." The third and final class helped participants learn to read drill sheets and try their hand at moving from formation to formation. The resulting experience was a deepened sense of appreciation - "We can't believe that young people do this and play at the same time," students said. At the end of the final class, a student cornered Bender and explained that there's usually a little attrition in these voluntary classes as people decide the subject may not be to their liking. Not so with this class. Bender blames the success of the class on Ed Dempsey's support and, of course, on the quality of the corps performances. Amy South, a percussionist and current member of three groups, indicated, "What surprised me was the interest and enthusiasm of the others in the class. As for me, does DCI have a very senior corps division?"